Want to compete with the best of the best? Then hit the ground running. Here's how. The toughest job in business is taking over as a new leader. You have to quickly assess the situation, pull together a strong team, decide on a strategy, and inspire everyone to execute it. The stakes for new leaders are even higher. Whether you've been brought on to fix something that's broken, launch a product, move the company in a new direction, or head up a division, every new leader is under the gun to get up to speed and begin producing strong numbers- ASAP. In Hit the Ground Running, Jason Jennings introduces us to America's best performing new CEOs who pulled off the most impressive transformations of the decade. They doubled revenues, more than tripled earnings per share, and doubled their company's net profit margins. 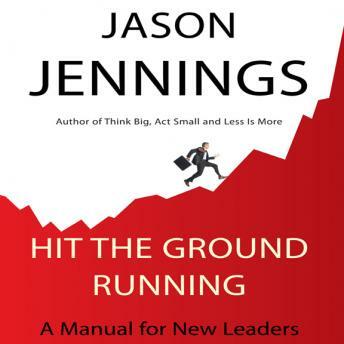 After interviewing and analyzing the stories of these top leaders, Jennings delivers their hard- earned, battle-tested strategies, which will inspire any new leader to take the helm and start delivering. When Richard and Tim Smucker were appointed co-CEOs of The J. M. Smucker Company, they shared their strategy with everyone and got them on board with their mission. Since then, Smucker's went on to dominate the markets and bring in billions of dollars of new business. Mike McCallister, the CEO of a twenty-billion-dollar health-services giant, decided to stop pretending and publicly admit that health insurance is broken. Humana began to replace a crippled, complex, and confusing system with one that works and has more than tripled revenues, earnings, and share price since McCallister took over. By processing change in bite-size pieces, Jeffrey Lorberbaum led Mohawk Industries through twenty successful acquisitions and turned his family's carpet-making business into the largest flooring company in the world.